For some levity given today is Friday, let us get to the really contentious matters of late. Is the percentage sign acceptable in text? According to the AP, it now is. Thankfully, xkcd was on it and took a look at the acceptability of various forms of expressing a percentage. Baseball is almost upon us. And oh boy do the Baltimore Orioles look bad. How bad? Historically bad. 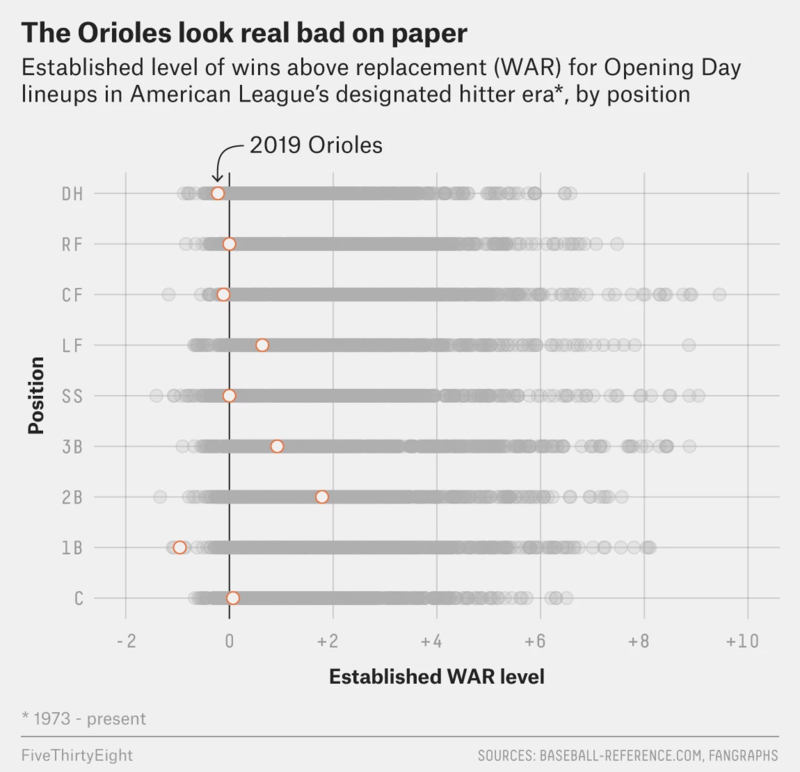 FiveThirtyEight went so far as to chart the expected WAR, wins above replacement, of each position of all teams since 1973. And the expected Orioles lineup looks remarkably bad. They are going to be so bad. What is nice about this graphic is the use of the medium grey for each team/year combination. I may have used a filled orange dot instead of open, but the dots do at least standout and show the poor positioning of just about everything but the second baseman. Credit for the piece goes to the FiveThirtyEight graphics department. As many of you know, genealogy and family history is a topic that interests me greatly. This past weekend I spent quite a bit of time trying to sort through a puzzle—though I am not yet finished. It centred on identifying the correct lineages of a family living in a remote part of western Pennsylvania. 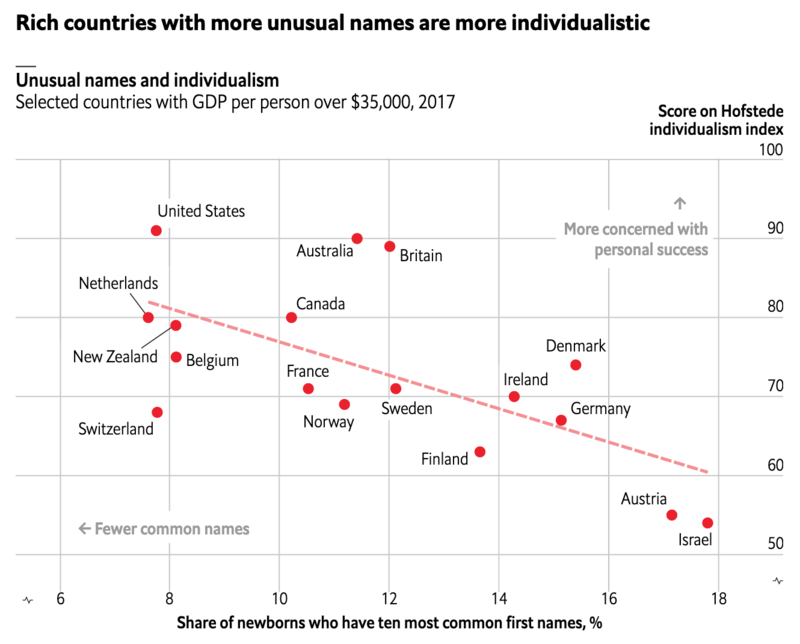 The problem is the surname was prevalent if not common—something to be expected if just one family unit has 13 kids—and that the first names given to the children were often the same across family units. Combine that with some less than extensive records, at least those available online, and you are left with a mess. The biggest hiccup was the commonality of the names, however. It’s easier to track a Quinton Smith than a John Smith. Taking a break from that for a bit yesterday, I was reminded of this piece from the Economist about two weeks ago. It looked at the individualism of the United States and how that might track with names. The article is a fascinating read on how the commonness or lack thereof for Danish names can be used as a proxy to measure the individualism of migrants to the United States in the 19th century. It then compares that to those who remained behind and the commonness of their names. But where are the Brendans? The scatter plot above is what the piece uses to introduce the reader to the narrative. And it is what it is, a solid scatter plot with a line of best fit for a select group of rich countries. 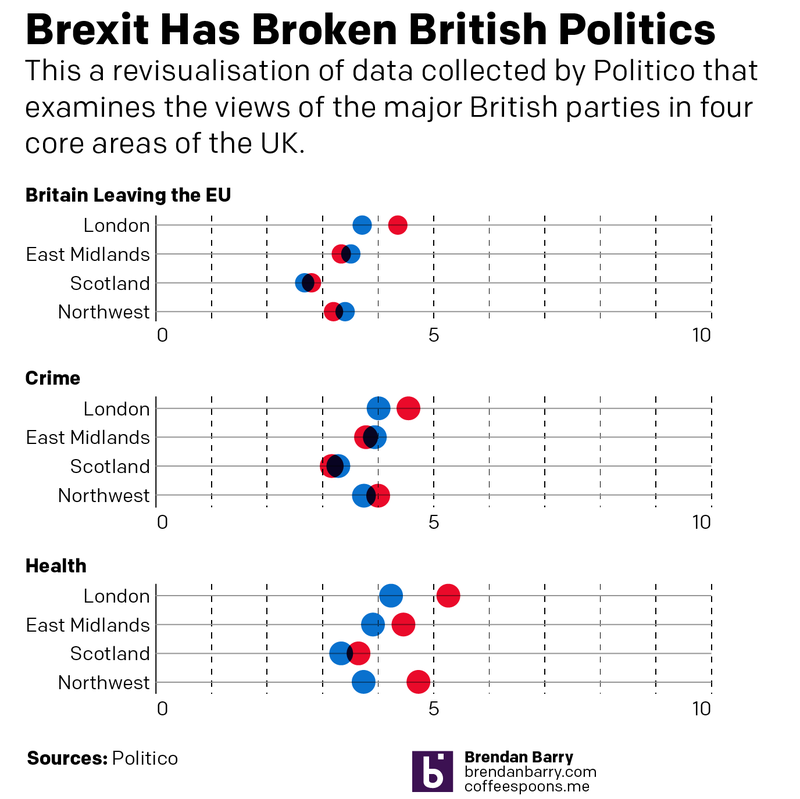 But further on in the piece, the designers opted for some interesting dot plots and bar charts to showcase the dataset. Now I do have some issues with the methodology. Would this hold up for Irish, English, German, or Italian immigrants in the 19th century? What about non-European immigrants? Nonetheless it is a fascinating idea. Well we have another week and so we have another fraught day of House of Commons votes on Brexit. Once again, it looks like HM Government will lose all the votes, but the question is by how much? Significant defeats means there will be little support, but smaller defeats might show the European Union that it needs to open up the Brexit Withdrawal Agreement and renegotiate it. But that’s not all. 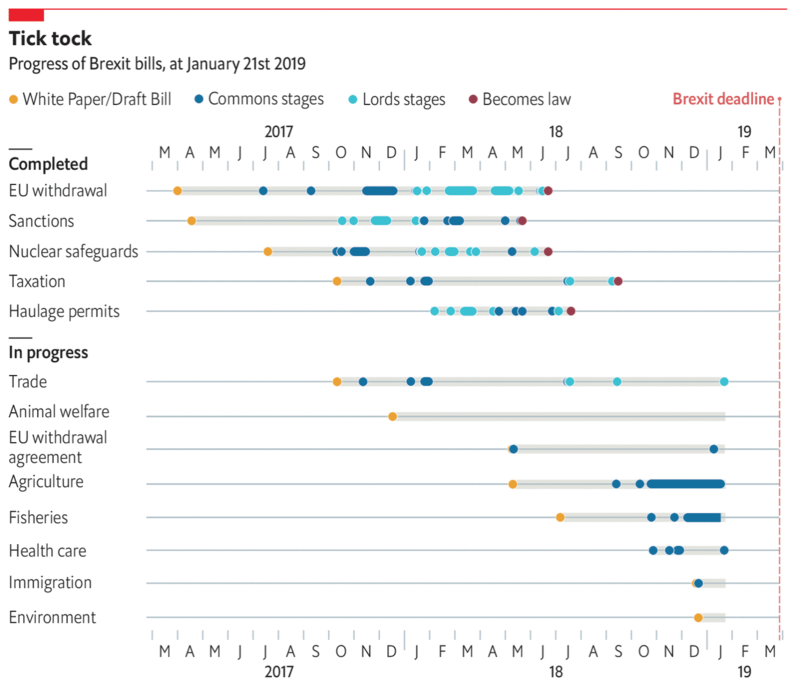 As this piece last week from the Economist shows, the Withdrawal Agreement is just one piece—an admittedly very large piece—of many pieces of legislation that need to be passed into law to manage the UK’s withdrawal from the EU. And while some have indeed been passed, many others are languishing. The piece overall is effective. It clusters the bills into those that have been passed and those still in the works. And then within each of those, the various stages of the British legislative process exist as colour-coded dots. My quibble would be with those dots. There are a few instances where dots overlap and I would have either made the dots transparent or stacked them vertically above and below the line, just to make it clearer to the reader where the dots are located. We are now less than 100 days away—95 to be exact—from the 2018 midterm elections here in the United States. As we get closer and closer we not only get more information from polls, but also campaign finance reports. Those can sometimes serve as a proxy for support as lots of grassroots support can dump lots of cash in a candidate’s war chest. Wheras a candidate who drums up little support might find him or herself with scant funds to fight the campaign. So what does that funding tell us right now? Well last week Politico posted an article looking at that data. They broke the dataset into chunks by the likelihood of the results. This screenshot is of Pennsylvania’s 1st Congressional District. 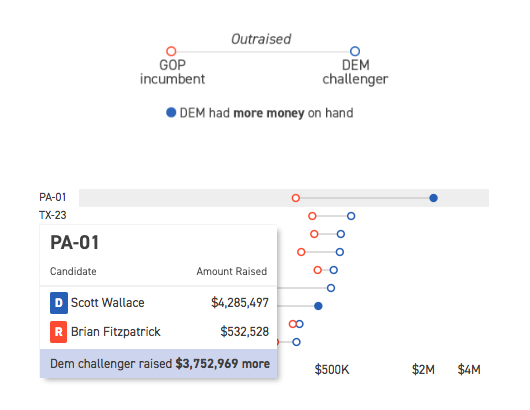 Each district is represented by a dot plot, with the total money raised by each candidate plotted, the distance in grey being the amount by which the Democrat outraised the Republican. This is a nice piece as the hover state provides a nice grey bar behind the district to focus the user’s attention. Then for the secondary level of information in terms of cash on hand for the Democrats, i.e. who has cash now, we get the dot filled in versus the open state for simply money raised. Then of course the hover state reveals the actual numbers for the two candidates along with the difference between the two. The funny thing with this particular district, the Pennsylvania 1st, is that Wallace is not necessarily raising a lot of money. He is a self-funding millionaire. He also is not the most electable Democrat in a competitive seat. It will be fascinating to watch how this particular district performs over the next few months, but most importantly in November. Credit for the piece goes to Sarah Frostenson. Last night President Trump nominated Merrick Garland to fill the seat left by Anthony Kennedy. Just kidding. But he is up for a vote in the Senate. Also just kidding. No, instead, President Trump nominated a very conservative judge for the Supreme Court, Brett Kavanaugh. How conservative? 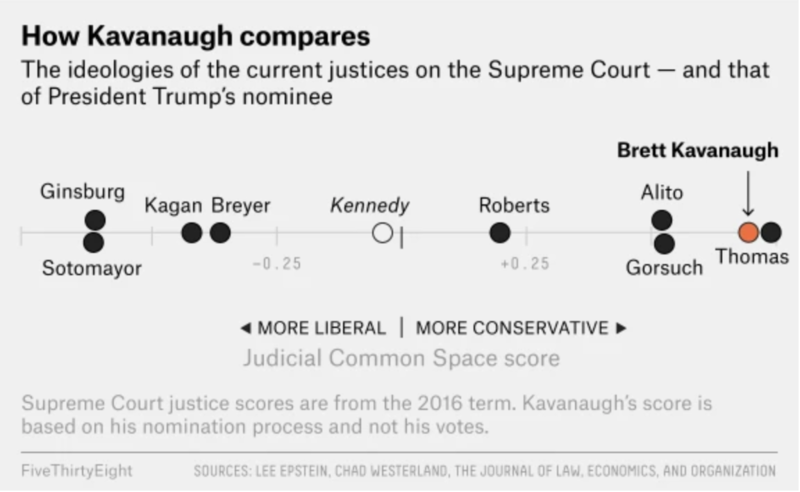 Well, FiveThirtyEight explained in a piece that plotted the judge against his probably peers on the bench, based upon one measure of judicial ideology. And it turns out, spoiler, Kavanaugh sits just to the left of Clarence Thomas. And he sits pretty well to the right. 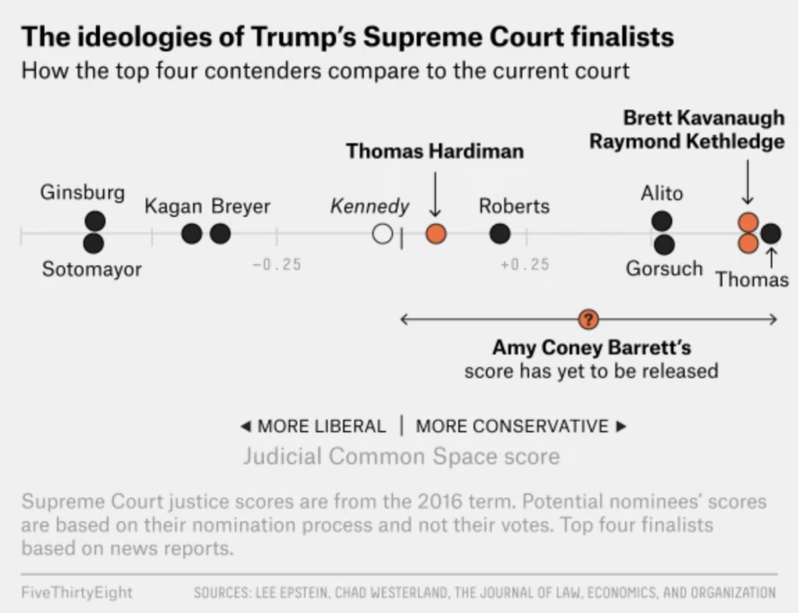 The graphic itself is an evolution of a piece from last Friday that looked at what were thought to be the four main candidates on Trump’s shortlist. The final piece, with only Kavanaugh plotted, removes the other potential candidates. And it functions well, using the brighter orange to draw attention from the black dots of the sitting bench and the open dot of the vacant seat. My slight issue is with the predecessor graphic that shows the four candidates. I probably would have just left off Barrett as she did not have a score. While I have no doubt that she would score to the right based upon all the reading I have done over the past several days, it feels a bit odd to place her on the graphic at all. Instead, I probably would have used an asterisk or a footnote to say that she did not have a score and thus was not placed. Credit for the piece goes to Oliver Roeder and Amelia Thomson-DeVeaux. If you live under a rock or in America, the World Cup starts today. (Go England.) 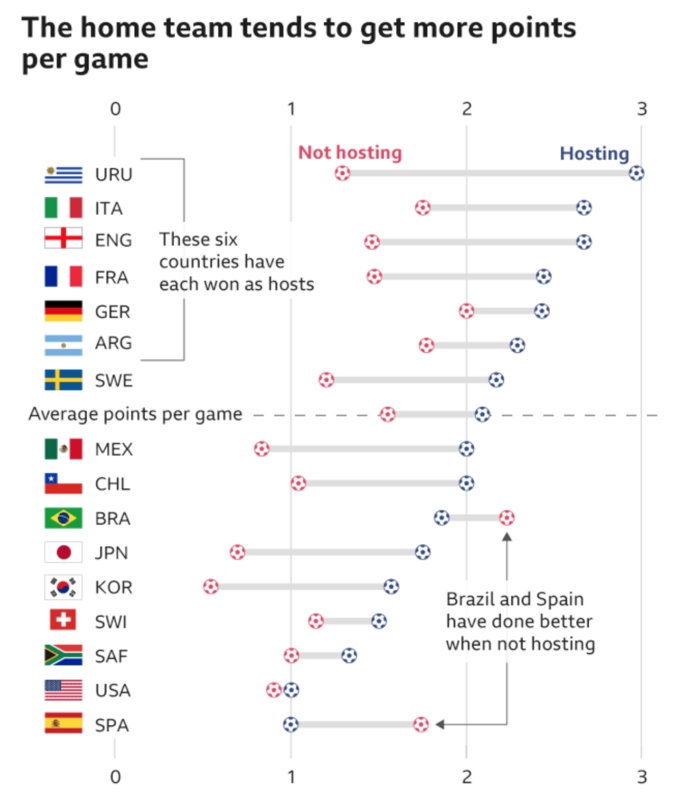 So what else to have but a chart-driven piece from the BBC from last week about the World Cup. 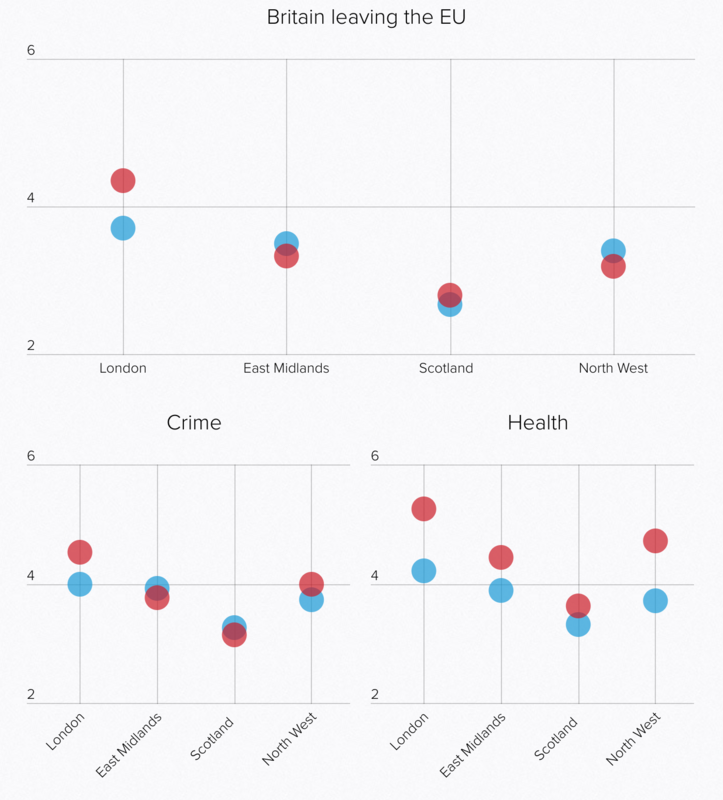 It features seven charts encapsulating the competition. But the one I want to focus on? It’s all about the host nations, in this case Russia. On its design, I could go without the football icons to represent points on the dot plot, but I get it. (Though to be fair, they work well as icons depicting the particular World Cup event in another set of graphics elsewhere in the article.) In particular, I really like the decision to include the average difference between a host nation’s points in non-hosting matches vs. hosting matches. It does look like the host nation scores more points per match than when they are not hosting. And that—shameless plug—reminds me of some work I did a few years back now looking at the Olympics and the host nation advantage in that global competition. Credit for the piece goes to the BBC Data Team. In news that surprises absolutely nobody, Russia “re-elected” Vladimir Putin as president for another six-year term. The Economist recently looked at what they termed the Puteens, a generation of Russians born starting in 1999 who have no memory of a Russia pre-Vladimir Putin. This piece features a set of interactive dot plots that capture survey results on a number of topics that are segmented by age. It attempts to capture the perspective of Puteens on a range of issues from their media diet to foreign policy outlook to civil rights. The design is largely effective. The Puteen generation sticks out clearly as the bright red to the cool greys. And more importantly, when the dots would overlap they move vertically away from the line so users can clearly see all the dots. And on hover, all the dots of the same age cohort’s interest are highlighted. I think one area of improvement would have been to apply that same logic to the legend to allow the user to scroll through the whole dataset without always having to interact with the chart. But that is a minor bit on an otherwise really nice piece. Credit for the piece goes to the Economist’s graphics department. Today is Tuesday, 12 March. And that means a special election in the 18th congressional district of Pennsylvania, located in the far southwest of the state, near Pittsburgh. Long story short, the district is uber Republican. But, the long-time Republican congressman, the avowedly pro-life type, was caught urging his mistress to abort their unborn child. Needless to say, that did not go over so well and so he resigned and now here we are with a veteran state legislator and veteran who calls himself “Trump before there was Trump” running for the Republicans and another veteran but also former federal prosecutor involved with fighting the opioid epidemic running for the Democrats. Now about that uber Republican-ness. It is so much so that Democrats didn’t even run candidates in 2014 and 2016. And then in 2016, Trump won the district by 20 percentage points. But the polls show the Republican, Rick Saccone, with a very narrow lead within the margin of error. That in and of itself is tremendous news for Democrats in Pennsylvania. But what if Conor Lamb, the Democrat, were to actually somehow pull off a victory? Well the Washington Post put together a great piece about how it really might not matter. Why? Because of that whole redistricting thing that I talked about. Neither Saccone nor Lamb live in the district that will replace today’s 18th. 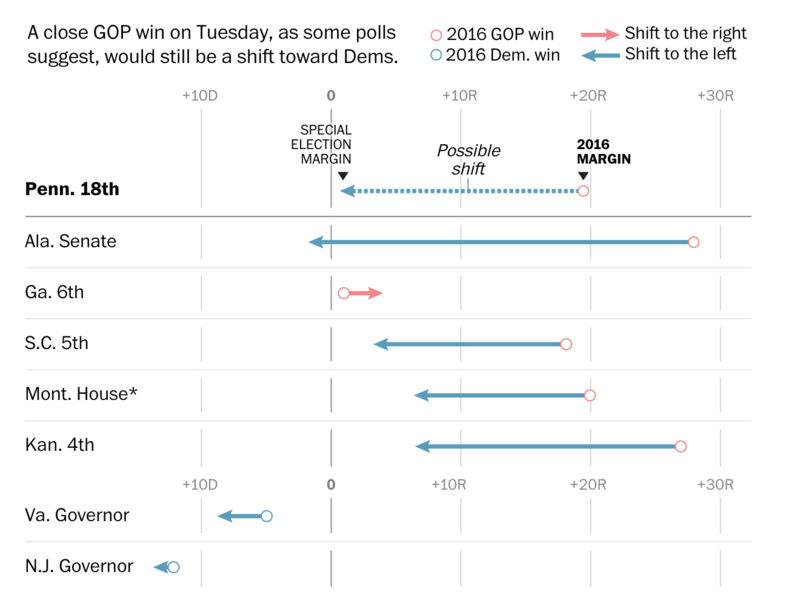 The piece has several nice graphics showing just how much this area of the state will change and how that will impact these two candidates. But my favourite piece was actually this dot plot. It speaks more to today’s election than the future of the district. Everyone will undoubtedly be looking to see if Lamb can eke out a victory of Saccone this evening. But even if he loses narrowly, the Democrats can still take a glimmer of hope because of just how insurmountable the challenge was. It would require an enormous swing just to crack 50.1%. Credit for the piece goes to Reuben Fischer-Baum and Kevin Uhrmacher.